You know what we don’t see nearly enough of? Big rig racing on tracks. Sure, we’ve seen the drag races in Canada and many a rig hooked to a pulling sled, but when was the last time you actually saw a field of big diesel-powered bruisers go for broke in a heat race? I’ve never seen that in my lifetime in person, and the sheer spectacle of watching tons upon tons of trucks racing around a road course at speeds normally reserved for sports cars has a hell of a draw to it, doesn’t it? I’m not going to say I’m a good driver, but put me in a proper sports car and I can rip around a track and look pretty good doing it. Try that in something with a 13-speed gearbox that was designed with exactly zero input onto speed-shifting down the front straight, that weighs as much as at least five Audi R8s and see if you look like you know what you’re doing. I’m simply stepping aside and yielding to those that know better…mainly because I do not trust the rolling stock that these trucks are on to do anything remotely sporting. If I’m hauling a flatbed a couple of states away, fine. Slowing down from 150 miles an hour before setting up into turn 4 while hanging onto a gigantic steering wheel like my life depends on it? 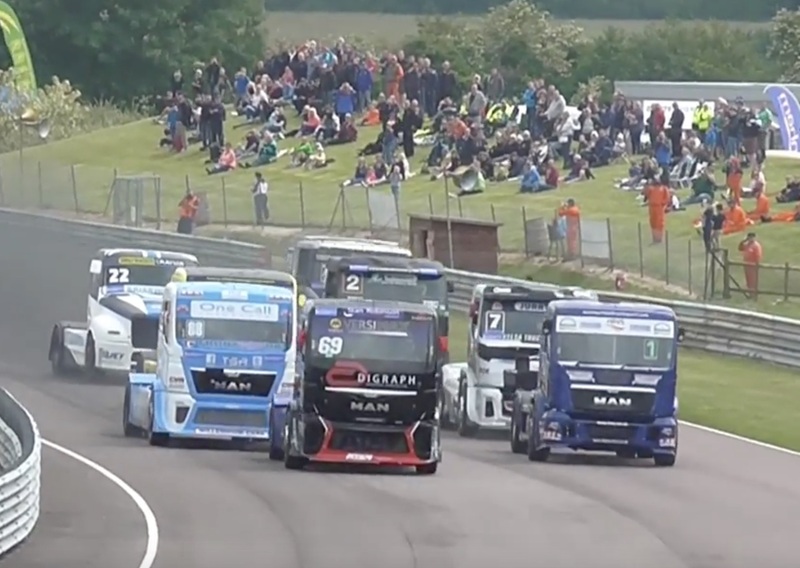 Tell you what, watch this footage of big rig racing from Thruxton Circuit in England and see what you think. Would you dare give this a shot?